The TraumaMan® System is an anatomical surgical manikin that is designed for students to practice a variety of surgical procedures. The TraumaMan® System was evaluated and approved by the American College of Surgeons in 2001 as an alternative to live non-human models or cadavers for ATLS, the leading Trauma Training Course. The system is now used to train over 30,000 medical professionals each year. Since its release, TraumaMan® has also become widely used in military courses, EMS training, and other trauma surgery simulations.The System is a simulated human torso with a ventilator and four anatomically correct surgical zones and an ankle base for IV Cutdown. 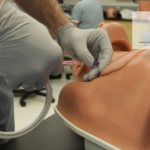 Its flexible design and replaceable tissues allow each student a “first cut” experience and for its incorporation into team trauma training.